In our last article about blocked drains and plumbing, we talked about the importance of good housekeeping i.e. not pouring fat down the sink or flushing baby wipes down the toilet. In today’s post we will continue to explore the problems associated with blocked drains and explain some of the ways you can go about ensuring the appropriate drainage of waste products. Drainage grids and gullies are found at the side of a property. They are used to dispose of excess rainwater, as well as waste from the pipes in your kitchen and bathroom. Similar to toilets, they have a water trap that is designed to prevent smells from the main line drainage escaping at ground level. The trap can also prevent debris from blocking the drainage grid and keep rats from entering the system. If you are having problems with your drainage grids and gullies or have noticed a funny smell, it may the result of a blockage. A number of things can cause blockages here, including solidified grease, fat and fibers from your sinks, washing machine and dishwasher and silt and debris that have collected in the water gullies. Leaves and debris can also form a seal over the top of the grid and prevent water from entering the gully pot. To prevent blockages from occurring (or to resolve them) you will need to pop on a pair of your finest marigold gloves and manually remove the blockage. Performing an annual or bi-annual clear out of your drainage grids and gullies will save you money in the long run, as it will prevent damage to your property. Our top tip is to make sure that when you put plates in your dishwasher or sink, that you remove any excess residue beforehand and pop it in your bin instead. If your drains are blocked, it may be caused by broken and damaged pipework, rather than a physical obstruction. This is more common in older properties, built before the 1960s, when they tended to use collar and spigot vitrified clay pipes. The problem was that there was little (if any) specification in regards to the use of pipe bedding and back fill. This often led to pipes being broken on installation or disturbed when back filled, resulting in leaks and blocked systems. A number of things can cause damage to underground pipework including the formation of fence posts and new extensions. Many people are unaware of the location of their property’s pipework and end up damaging it unknowingly. Tree root ingress is one of the most common causes of blockages. It is thought that the condensation that naturally occurs on the outer walls of a pipe or moisture leaking from the joins attract the roots looking for water. The roots can access the system through joints, fractures and cracks in the pipe, as well as through inspection chamber walls and benching. Once inside, the roots develop tap roots and masses, which reduce the internal bore of the pipe. Solids then get caught on the roots, causing blockages. Modern pipe systems are usually installed using rubber sealed couplings, however they are still prone to root ingress if they are not protected by barriers or surrounding concrete. If you think this could be the cause of the blockage, it’s best to get in contact with the experts here at TSM Plumbing. 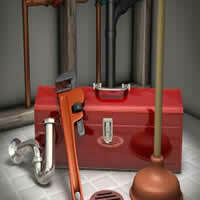 Damaged pipes can cause blockages. There are a number of things that can cause blocked drains, however annual clear outs and professional inspections can go along way in preventing and minimising costly damage. For more information or to enquire about our services, please get in touch.